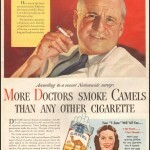 This Camel ad from 1946 depicts the results of a “Nationwide survey” into doctors’ cigarette preferences. How were survey participants chosen? Who were the “three leading research organisations” who conducted the survey? Was this research sponsored by Camel? Who analysed the survey results? There is a wealth of information available online to justify just about any marketing endeavour. In order to reliably anticipate the impact of our marketing campaigns, however, we have to base our decisions on more than bluster. Who is responsible for this information? For example, this short informative video from VideoCrisp appears to give lots of convincing reasons that video is the “next big thing”. Video is the Future – VideoCrisp from VideoCrisp on Vimeo. On first glance it appears to give plenty of convincing statistics and facts about the increase in video usage and popularity in recent years. Who? This video was created by VideoCrisp – a company who offer small businesses a “cloud based video creation tool”. Motivations? This video is a sales tool and their ultimate goal is (presumably) that you will engage their services and create your own promotional video. Sources? In this case the authors have provided lots of information about their sources, but it is a digital marketer’s responsibility to investigate the original context of the statistics and information and to see how it has been interpreted. For example, how valid is VideoCrisp’s claim that “By as early as 2012 if you don’t have video on your site the big search engine might not even list you” ? So where can I find unbiased information? In short: nowhere. All research will be coloured in some way by the researchers’ choices, or by those analysing the results. This is not necessarily done with malicious intent. All you really need to do is to question any information you find. This includes your own analysis of digital marketing statistics and campaigns. Some sources used for this article and for general information on marketing and video usage. Do you have any reliable sources for marketing information or statistics? Or any examples of ridiculously unfounded marketing claims?